Several initiatives have emerged recently to help newsrooms connect with the public, build trust and do a better job of bringing citizens’ voices into the news. But the news media have a long way to go, according to new data from Pew Research Center. 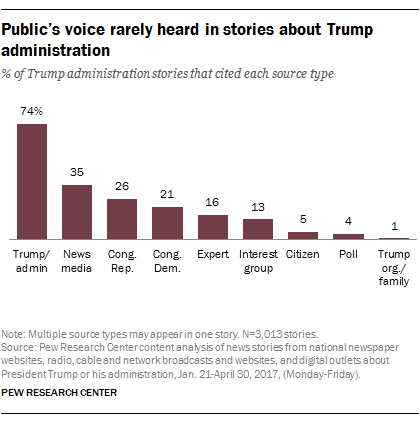 Just 5% of the more than 3,000 news stories studied during the first 100 days of the Trump presidency cited a member of the public, one of nine source types analyzed. That figure compares with about three-quarters of stories that cited Trump or a member of his administration, 35% that cited another news outlet or journalist, 26% that cited a Republican member of Congress and 21% that cited a Democratic member. Stories that cited a member of the public also are less common than those that cite an expert or an interest group. The low level of citizen voices held true for the five most prominent topic areas studied: the president’s political skills, immigration, appointments and nominations, U.S.-Russia relations, and health care. Across these five topics, which accounted for two-thirds of the coverage, citations of everyday Americans never rose above 7%. Along the same lines, only 4% of all stories cited public opinion polls, another way Americans’ views and attitudes get represented. Across the five main topic areas, the highest citation of polls was in stories about the president’s political skills (9%) and health care (8%). There was, however, one type of news programming that gave far more voice to members of the public than any other: network evening news. In the time period studied, the four network evening news programs (ABC, CBS, NBC and PBS) were at least four times as likely as cable, digital or radio programming to cite at least one citizen in their stories – 17% compared with 4% or less among the other three formats. 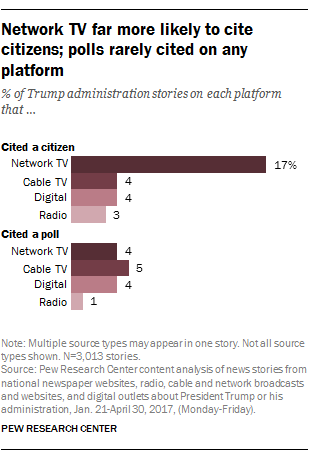 Network newscasts were as likely to cite poll numbers as other platforms, and were less likely to cite another journalist or news organization – 12% compared with 30% or more among the other platforms. While the three commercial network evening newscasts do not command the same level of audience numbers they once did, average viewership has remained roughly stable the last few years, reaching about 24 million viewers a night. And PBS NewsHour’s audience grew in 2016 to an average of 1 million viewers per night.